I've just realized I'm the opposite of Hawayo Takata. She was a brilliant marketer. 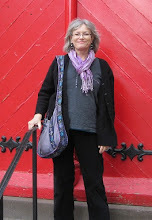 She traveled all over Hawaii and the west coast of North America teaching Reiki. She told people that she was the only one in the world who could teach Reiki, that she was the Grand Master of Reiki, that Reiki was secret, and to learn was expensive. Very expensive. Opposite. I'm right here in Maine. I don't travel well. All that 2 oz of fluid, shoes off, and X-ray. Crammed in with strangers, recycled air. I tell people there are plenty of good teachers in their area. I don't like secrets. I teach free classes to people with cancer. Opposite. Went to a fab Reiki class tonight. So many sincere, interesting, and accomplished people; so many people moved to learn about energy healing. Sometimes too sincere: I had to make jokes. I like to laugh. We crammed in to the cozy space: soft chairs, dim light, quilts, and a big quiet building. Dark outside, and cold. We talked about ethics, energy, and history. We meditated, did self-Reiki, and then Reiki on each other. Wow, the guy on my right had such hot hands! We took breaks. There was fruit, coffee, and tea. I passed out info on Reiki. Then I attuned all who wanted that. They all wanted that. So I attuned. I held my breath, traced symbols, blew, smiled, moved on, congratulated, and embraced. There are 10 new Level 1 Reiki practitioners in the world tonight. There is more Reiki light, Reiki energy, Reiki love. We are all connected by love and light. Thank you: Mikao Usui, Chujiro Hayashi, and Hawayo Takata. Thanks to all who help me spread Reiki. Yes, Reiki will change your life. I'm a strong believer in informed consent. So I would not intentionally share Reiki with a person who could not give consent. I would just be the best person I could be while near this person. Then again, sometimes it just turns on, right? Like I'll be holding a hand and I feel the Reiki energy coursing through me. I figure that's OK, I can't help it, it just happens. Re sending Reiki to a building or hospital unit.... well, me personally, I wouldn't do that, because someone might object. There are some people who are (for some strange reason!) opposed to Reiki. If that is the case, then I wouldn't send to a building. If all those who are alert and oriented agree to it, then OK. Make sense to you? 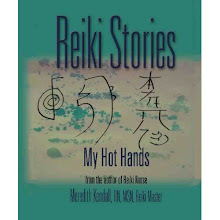 It has come to my attention that some people are offended by the cover of my latest book, Reiki Stories. Many people hold these symbols to be sacred. They object to the symbols being placed on a public item, an item for sale. Again, I apologize. It was thoughtless of me. I didn't consider this when designing my cover. I was just trying to express what Reiki means to me. I was in the zone, the Reiki zone. I was painting, arranging, and photographing. I was creating a cover. People have told me that they didn't buy the book because of the cover. I don't like secrets and I love the symbols. That's all I've got. Tree pollen. Before the leaves come out. You? Insomnia, itchy eyes, sinus pressure, and sneezes. You get this too? Windy days aggravate, rain alleviates. My treatment: stay indoors, rinse pollen off hair before bed, diphenhydramine (found in Tylenol PM), and echinacea tincture. That's the best, echinacea tincture. Daily self-Reiki, of course. What are your remedies? A federal judge sided with the Governor, supporting the decision to remove the mural, which depicts the history of the Maine labor movement. The judge noted the Governor's right to "government speech." What happened to "...government of the people, by the people, for the people"? The mural is hidden in a secret location, locked up; silenced. So I'm sitting on my deck, typing, under starlight, in this freakishly warm weather (see previous post- summer in March). I hear cracklings in the garden, I see moths in the darkness; a mosquito just landed. It occurs to me that last week the ground was covered with snow and ice. And now... look, listen, feel. Life is emerging, unfurling, jumping out at us. There is an explosion of life. Beetles, flying things, flowers, mice, songbirds.... spring bursts out of the ground energized by the heat, light, and warmth of the Sun. Ice storms, blizzards, power outages, snow on the 4th of July.... I've lived through a lot of weather here in Maine. But this week is the most freakish weather spell I've ever experienced here. It's March in Maine. There should be 2 feet of snow on the ground, wind, slush, and ice. There could be a day or two of sun and 50 degrees and we would all exclaim about the gorgeous weather. This week it's been sun and temps in the 70s and even 80s. It's like summer. I've seen flies, bees, and mosquitos. My flowers are blooming: crocuses, daffodils, and pansies. I raked out my garden yesterday and planted kale, spinach, and peas. I waded into a pond yesterday. I taught an energy workshop this evening, just got home. I drove past the pharmacy at nearly 8 pm, and the temp flashed on the sign: 73 degrees. I'm sitting on my deck in the starlight, wearing just a T-shirt and yoga pants. It's humid; it feels like July. Sure it feels nice, but it's kind of scary, right? March in Maine is usually winter, but right now it feels like summer. Very strange weather we're having. seems to have sprung in March in Maine. It was 70 F again today. Snow is gone, ice is out. I saw 3 young men, likely from the local college, tossing a frisbee and drinking beer beside the Sandy River. The vision was shades of brown, white, and blue. Grass, fields, river, and trees brown; all shades from tan to deep rich cocoa. Sky was Wedgewood blue. Boys' chests and legs startling white. Maine skin white. Which is healthy, by the way. Own your skin color! Don't try to change it with creams or tanning beds. Ok. Back to spring. I love the songbirds. The sun and temps are wonderful, but scary. I mean, global warming. March in Maine is usually snowy, 30. If you're lucky: 40. But 70? Freaky. I had an appointment with my wonderful nurse practitioner this morning. That's right, not a doctor, an NP. The schedulers never book enough time and we gab way too much. "We're just going to have to go out to lunch sometime," she said. We talk about nursing, health, various conditions, friends & relatives, and our own health. We collaborated on my health plan and decided to snooze on a mammogram and a colonoscopy, but plan that I will lose 5 pounds. I like to snooze. Best part: my numbers. BP down. Cholesterol and blood sugar down. Good fat (HDL) up. Bad one (LDL) down. Is it the seeds? I eat seeds every day: chia, sesame, sunflower, and flax. I also eat that Shakeology stuff: roots & plants with intense anti-oxidant properties. Numbers were good; doing something right. It's Sunday, March 18 and I went to Portland for breakfast. I went to Micah's restaurant in the Old Port, a section of town where there are lots of bars, restaurants, and shops. Pricey. Tourists and artists, coffee shops and wharves. I walked around with Fluffy the 13- year-old Sheltie. So yesterday was St Patrick's Day: looked like it was a wild night in the Old Port. As we walked, I noted the detritus of the bacchanalia: broken green beads, deflated blobs of green balloons, a man's yellow tie, a server's black apron, broken glass, and suffering partiers who stumbled slowly in and out of breakfast cafes or simply sat beside the harbor: head in hands. It's where I found my fire juggler and the black sand beach of Hawaii. Cool site. So my offer is for distance Reiki. Today I got my first response. A request for Reiki to a woman in Zurich, Switzerland. I sat on my deck in the afternoon sun, an unusually warm day for March in Maine. I traced Reiki symbols into my palms, closed my eyes, and repeated the woman's name in my mind. My hands got hot and started to throb. I put them together, like making a ball with my hands. I blew into my hands. The neighborhood sounds fell away and feelings washed over me: fatigue, fear, grief, and nausea. I sent love and healing to the woman in Switzerland. Gradually my awareness came back. I heard birds, then cars and motorcycles. My hands stopped throbbing. I detached my energy from hers. I hope it helps. Best wishes for your best healing. Speaking of informed consent, just because you can read someone's aura doesn't mean you should. Right? Don't you think you should ask? Before searching someone's soul... inform. Ask permission. Hang a sign and do readings. But don't walk around reading people, and then telling them you see "dark stuff" or their past lives. You need to ask first. It's a professional boundary. Like when you visit someone's home, sure, you can snoop through cupboards and drawers. But should you? Same thing. Guess I just have ethics on my mind: I've been grading ethics papers all week. We talked about ethics at our Reiki share last Thursday. Informed consent was one topic. One person asked, "How do you get consent to give Reiki to someone who is unconscious?" At the share, many practitioners expressed support for informed consent. That is, we do not share Reiki without first obtaining permission. Sometimes we have to try to explain Reiki before obtaining consent, so we talked about how to do this also. I said, "I don't try to explain how Reiki works. I explain what I'm going to do, and what the client needs to do. I tell them they will relax, fully clothed, as I place my hands gently on their head, arms, and legs. I tell them they can keep their eyes open, but it usually works better if they close their eyes and relax. I say they can talk, and for sure to tell me or move around if they are at all uncomfortable." One person said, "If they can't verbally give informed consent, then I learned I can ask their higher self if it is OK."
I said, "I too learned that we can ask the higher self, if the person is unable to speak, but I don't like to do that. I'd rather get permission from family members, if the person can't speak or indicate consent. I would never share Reiki with someone who expressly said they didn't want it. I wouldn't do Reiki anywhere near that person." Several people nodded in agreement. I told them about MaryAnne. I used to work with MaryAnne at a small hospital; she was selected to be my supervisor when I set up a Reiki program there. I thought she was an odd choice to supervise the program, as she was morally opposed to Reiki. Then it seemed to make sense. Who better to help me figure out how to explain and present Reiki to people who shared her beliefs? Who better to help me discern those who would not like to share Reiki energy? MaryAnne told me, "Tell them you're channelling. That will cue people like me right away that this is not for us." So at that hospital we had to tell everyone we were channelling. But are we? Do we channel energy? Or do we create a space for relaxation and healing to occur? I used to believe the Diane Stein channelling theory, but lately I've gone more to the Pamela Miles space model. So, not sure how it works, but I know that people like it. I've seen amazing results. It doesn't seem to harm. Whatever it is, however it works, we must obtain informed consent before initiating a session. I support client autonomy. I respect a client's right to choose if this something they'd like to try. I hope you will do the same. But they're scary. They remind me of lions. Who knows when they might pounce? And gross. They poop in boxes of sand and then jump up on your counters and tables. ick. Expensive and labor intensive. Cat food: dry or canned? Vet bills, kitty litter, and fur balls. Yet so beautiful, aloof, and healing. I remember walking to work, predawn, Honolulu. The feral cats slept in herds or packs in alleys and vacant lots. Sweet and scary. Cats are worshipped in some societies. I know one who eats fresh local organic, gets acupuncture, Reiki, and homeopathy. My dog is lonely and wants one. They scare me. Went to way cool Reiki share tonight. What made it so good? The people, obviously. B was there, in his new purple shirt. His name is embroidered on the right chest. J, the survivor, with her bright spirit. JS told us about her webinar with Pamela Miles. N is going to be attuned to master/teacher on the vernal equinox. E talked about politics of healthcare and working with Native elders. L led us in meditation and distance healing. Then he recited the Reiki principles in Japanese. Japanese! Ly talked about how she does distance Reiki. She places the name of the recipient on her Reiki rabbit. K soaked it all in, radiant. J and C stopped in for mere moments, sharing energy... moving on. M is ready for Level 2. We laughed. There was an abundance of kindness, gentleness, caring, erudition, and tolerance. My favorite things. We talked about professional boundaries, informed consent, distance Reiki, medical Reiki, other integrative modalities, research, and cultural diversity. Educated and experienced people talking about Reiki, oh my yes, I was in hog heaven. Dear readers, wish you'd been there too. A co-worker asked me about Reiki today. She said, "I had a Reiki session this weekend. The lady told me I had two chakras going the wrong way. She said that was bad. What do you think of that?" "What do I think? I think she wanted you to go back for another session. She's reckless and irresponsible," I blurted. "Let me explain. First of all, the practitioner should remain positive. She shouldn't tell you something's wrong with you. Second; the session should be about you. Your journey, your experience, your insights. When she told you what she perceived then the session became about her. Her ego, her vision, her experience. What else? Well, chakras are from yoga, not Reiki. Did she tell you that you need another session?" "Yes, she did. I'm going back next week," my coworker told me. "Umm hmmm. Well. Sorry to say so much, I"m just telling you what I tell my team of practitioners. We practice medical Reiki, anyway, not shamanic Reiki," I explained. "Because we practice in a medical institution, we work in a way that would be acceptable to nurses and physicians. We don't diagnose medical problems, we don't give bad news, and really, we don't say much. It's not about us." Anyway, that's what I told her. How about you Reiki practitioners out there. What do you think? Is your practice similar? So they say there are more opportunities in the city: more culture, jobs, businesses. Really. Cause I go to the country to get things done. Car broke. $100 in the city, $20 in the country. Gym. $10 in the country: walking track, pool, classes, and weights. In the city? I can't even find a gym. Yoga classes are $20/per. Ferget that. Town office? Well here it's City Hall. It's in a scary neighborhood and there are 2 parking spots. On a hill. There, in the country: plenty of parking, no lines, and I went to high school with the clerk. Post office. Parking is a wash. In the country, I know the postmasters. Here, no. Friends. No one talks to me here in the city. No one says, "Nice haircut!" "New coat!" All my friends are back there in the woods, in the small town, in the place I lived for 30 years. Sometimes it feels like a razor blade to the heart; but there is love: hugs & healing too. Job. Yeah, it's here in the city. Reiki? Here. I love my job and my Reiki. Dog. She's here with me. Spent her whole life in the country, in the woods. She snuffled after deer, turkeys, cats, and raccoons; she wandered the forest and always came home. Now she is the queen of the back yard. My vet is in the country. Veterinarian. She's capable and caring. She communicates well. She's quick and cheap. Health care. I love my Nurse Practitioner. Yeah, in the country. The secretary knows to book extra time because my NP & I gab the whole time. She's a medical intuitive. She's wonderful. Oh, and I know all the docs there too, because I worked with them. Here? In the city, I know no one. Culture. Yeah, thought I'd be going to art openings, film festivals, and lectures. Hasn't turned out that way. I work and sleep, walk the dog. Health food stores, hippies, professors, philosophers, local organic, local honey and herbal products. Country, oh yeah. Here, not so much. Yes, they are. Cost me $60 to fill the gas tank this week. And then my speedometer did the weird thing it does. It goes all the way around to the other side of zero and gets stuck. It's done this odd thing twice before. Both times I took it to a Dodge dealer and got it fixed. This is how they fixed it. A guy came out with a handheld device, punched some buttons, and it was fixed. It took about one minute. They charged me about $20. This time was different. I live in the city now, so I went to the Dodge dealer here in the city. I described the problem and the usual fix. "That's going to be ninety-nine, ninety five," he said. "They usually charge me $20," I replied. "The dealer in Farmington. But I live here now"
"Let me see what I can do." He hopped off his stool and sped into the back. He was a lot shorter off the stool, just over 5 feet tall. I stood there waiting. He came back. "We can do it for $45," he said proudly. "But they do it for $20 in Farmington," I wailed. "Maybe you'd better take it back to Farmington," he said firmly. "I guess I will. But thank you! Thank you for getting me a better price!" I smiled and departed. Today I took it to the dealer in Farmington. I parked, went inside and described the problem. I didn't mention the city dealer. A guy went out with a handheld device and punched some buttons. It was fixed. It took about a minute. They charged me $20.94. this guy says he read Reiki Stories and he liked it. Says it's available at Amazon & B&N. cool! Click here to order today. Or here. Thank you. Thank you, Mark LaFlamme, author and movie editor. Thank you, movie editor, Mark, and thank you, millhopper the fire juggler. So... had big plans for today. Visit a sick friend, call family, fetch spring water, mingle with society, prepare for lectures, climb a mountain, cook, and do housework. Jane Eyre took over. Couldn't put it down. I carried to the kitchen, read outside in the summerhouse as snow melted and Fluffy sprawled in the slush, read in my sunny living room. On a nook you can't see where the end is, and if it's good you just keep reading. I did. I laughed & cried, I marveled at the language, the vocabulary, the sensitivity, details, and most of all: the unsaid. I suffered as an orphan, poked up the peat fire, wandered the moors, recoiled from the marble minister with the Greek profile, and finally sat happily on Mr Rochester's lap. It's a classic- as such- a free download. Read it recently? Be Jane. Now I'm reading Jane Eyre and oh my gosh, it's so good. When did you read it last? There are elements of Buddhism. It's about suffering, abuse, and the rich and powerful v the poor, noble, intelligent, imaginative- hey, it's about the 99% v 1%. It's about orphans, being cold & hungry, and wanting to learn. I think it's about love too, but I haven't got to that part yet. So far poor Jane is decidedly unloved. Yes, I'm an INFJ. Took an online test. Heard from another INFJ Reiki practitioner recently. hmmm, are there more of us out there? I'm strongly extremely introverted, moderately intuitive and feeling, and just slightly judging. I'm a counselor, on the cusp of healer. Online sites told me that INFJs are just 1-3% of the population. We make good counselors, good listeners. We like helping people but need solitude to recharge. We might be visible, but are highly private, sharing our deepest feelings with just a few. We have rich inner lives; we use language proficiently. Well, yeah ~ what is better than learning a new word? I get excited when a person uses a new or unusual word. I like to read the dictionary. We are imaginative, poetic, and psychic. You can find us in libraries, clinics, and at peaceful protests. We want to help you. We want to change the world. We may be so interested in feelings, imagination, and intuition that the physical world falls away. How are we perceived? OK, many see us as distant, aloof, blunt, even rude. We may be seen as anti-social, stuck-up, cynical, or cold. Oh my. So unfair. People fascinate me. I want to save the world. I want peace, love, glitter, rainbows, and unicorns. Take the test, who are you? Thinking about this lately. Someone recently described the fun of blasting open the Earth to mine crystals. I had a visceral reaction- the cells in my body recoiled - no thought - just feeling. Like Gaia feels? I don't know. I'm trying to figure it out. I welcome your thoughts. I love stones and crystals. I pick them up in the woods and at the beach. My teacher Angela told me years ago to ask the stone if it wants to come home with me. So I do that. Do it in stores too. I've picked up stones in Sedona, Maine beaches, & Maine woods. I buy stones and crystals. Sometimes from miners, sometimes from New Age stores. I wear stone jewelry and stones are placed all around my house and gardens. Is it wrong? Should we leave the stones and crystals where they are? Are we ripping them out of the heart of Gaia? I worry about stuff like this.